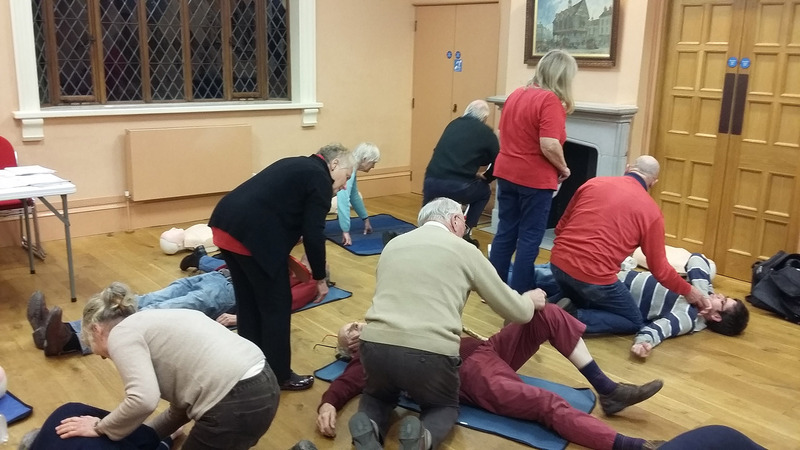 A well-attended Herefordshire Heartstart Course took place at Grange Court, Leominster on a chilly evening at the end of January. Four Heartstart volunteers trained 20 people local to Leominster. On the free 2 hour course they learned how to: deal with an unconscious casualty, recognise the symptoms of a suspected heart attack, deliver CPR including an understanding of the role of a defibrillator, as well as how to deal with choking or serious bleeding. We were very lucky to have Councillor Clive Thomas attend on the evening. Cllr Thomas informed us of the defibrillators currently placed around Leominster that can be used by members of the public in an emergency. Fundraising is ongoing to ensure the maintenance of these machines. Cllr Thomas has been a driving force in the fundraising and siting of these machines in Leominster and is passionate about their presence. The defibrillators can be found in Black Swan Walk, Corn Square and Morrison’s Supermarket. Another one is soon to be sited on the Industrial area. Why not look out for them the next time you are in Leominster? For more information on Herefordshire Heartstart and the courses we run please take a look at our website www.herefordshireheartstart.org or email our charity coordinator info@herefordshireheartstart.co.uk.